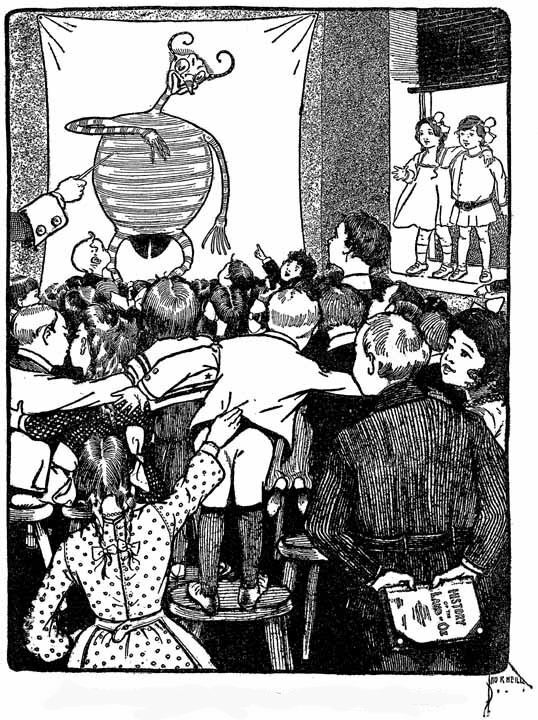 The Wogglebug is enlarged by a magic lantern projector, and steps off the screen in his large form. It’s been suggested that this means there would still be a smaller woggle-bug, but such does not appear to be the case. This is, however, part of why Harkam suspects the Professor of being an Old One in Phyllis Ann Karr’s “The Eldritch Horror of Oz.” According to Professor Nowitall in Bucketheads in Oz, Mombi tried to take the magnifying screen so she could enlarge the members of Jinjur‘s army, but he destroyed it. In retaliation, Mombi transformed both the Professor and his wife. The Red Rogue of Dawna in The Enchanted Island of Yew uses a spell to grow “bigger than the biggest giant,” presumably just on the island, as he’s obviously nowhere near as big as some Ozian giants. Interestingly, he didn’t become any stronger, and he was pretty weak to begin with. Bunnybury has a wicket gate, likely installed by Glinda, that gradually shrinks down anyone who walks toward it to rabbit size, then restores their normal size when they leave. The gate is maintained by a bunny named Bristle. Glinda is also responsible for the powder that the Scarecrow uses to shrink down the Wicked Witch Blinkie until she agrees to undo her enchantments. He leaves her at the height of his knee. At the end of Jack and Larry Breton’s Ork, she regains her original size, but is told that she will shrink down again if she touches another magical instrument. Since she’s small again in Karr’s Gardener’s Boy, she might have done so at some point. At least, that’s a convenient way to make both of these tales work together. The Wizard of Oz is responsible for shrinking twelve monkeys from the Forest of Gugu so they’d fit inside Ozma’s birthday cake. The same monkeys had earlier been transformed into giant soldiers by Kiki Aru, but if the illustration is any indication, that made them human instead of just changing their size. When he disguises himself as Crinklink in “Little Dorothy and Toto,” he grows and shrinks quite a bit. 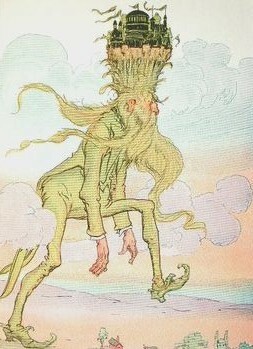 In Lucky Bucky, the Scarecrow suggests that the Wizard could shrink Davy Jones down to a size that would fit in a fishbowl, but he’s not keen on the idea. The Wizard also has a shrinking powder that’s used in Eric Shanower’s Secret Island and Giant Garden. On Pessim’s Island, there are lavender berries that make anyone who eats them shrink, and dark purple ones that have the opposite effect. Trot and Cap’n Bill use the berries to become small enough for the Ork to fly them to the mainland, and later feed them to some birds in Mo so they can obtain giant size. The berries reappear in Gardener’s Boy and Melody Grandy’s Disenchanted Princess. In the latter, we learn that Zim Greenleaf has grown some more of them in his arboretum. The Frogman grows to human size by eating magic skosh, a plant that grows in a pond on the Yips’ mountain. It increases his intelligence as well. In Eric Shanower’s “The Final Fate of the Frogman,” he reports that he later ate more of the skosh, but it had no effect on him. Disenchanted Princess has an electric sea slug who grows to enormous size by eating squillosh, the saltwater equivalent of skosh. In Tin Woodman, Polychrome shrinks down herself and her companions (Nick Chopper, the Scarecrow, Woot the Wanderer, and Captain Fyter) so they can travel through a rabbit’s burrow to Nimmie Amee’s house. In Kabumpo, Glegg’s Box of Mixed Magic contains a substance called Instantaneous Expanding Extract, which Ruggedo tests on the rabbit Wag and Peg Amy in doll form. The rabbit ends up being about six feet tall. The Nome uses the rest of the liquid on himself, causing him to grow into a giant three-quarters of a mile high. He’s later shrunk down again with Triple Trick Tea, but Wag retains his size. Cowardly Lion has Notta Bit More and Bob Up being pulled through a keyhole into the Kingdom of Doorways. They don’t know whether they shrink or the keyhole grows, but they definitely feel like they’ve been through a keyhole. The Big Wigs of Ev become giants when they wear their magical wigs. Prince Evered takes one from Princess Elma and uses it to fight his usurping uncle. According to March Laumer’s Good Witch, these wigs grow on a tree, and the spirit of King Cheeriobed’s father becomes trapped in one. The back story of the residents in Baffleburg in Jack Pumpkinhead reveals that they were originally tiny Reddies. When one of them did a service for a magician, this magic-worker enlarged them to human size and their tiny city accordingly, but they would only remain so if the liquid remained in the Forbidden Flagon. I expanded upon this in my own story “Reddy and Willing.” When Jack breaks the flagon, the Baffleburghers are reduced to their ancestors’ former size. Jack Pumpkinhead also has Snif the Iffin shrinking when he eats some shrinking violets that were used as decoration on one of the Red Jinn‘s dishes, but the effect eventually wears off on its own. Rachel Cosgrove Payes’ short story “Percy and the Shrinking Violet” has the sorceress Violetta cultivate a more powerful sort of violet that shrinks anyone who even smells it, as well as pins that nullify their effects. 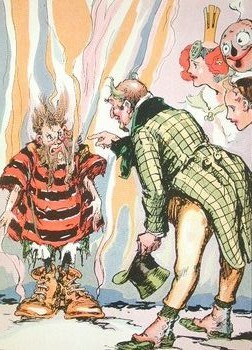 Loxo the Lucky, the mountain-sized giant in Speedy, is reduced to human size when he eats a double-action shrinking-magic malted spongecake made by the wizard Waddy. The illustration of this is odd, as it has Loxo wearing clothes slightly too big for him. Usually clothes shrink or grow with the wearer, and if they hadn’t they would have stayed enormous and he would have been naked. Another animal who grows to unusual size through magic is the white rat Percy the Personality Kid, who eats from a magic muffin in the Hidden Valley. Its effects wear off, but the Wizard manages to make him permanently large. Terp the Terrible uses the same muffins to turn into a giant, and presumably shrinks back to human size when trapped in his smokestack with no access to the muffins. I believe it’s specified that a bite of one of the muffins makes someone grow to ten times their normal size. Visitors to the Princess of Little in Dwindlebury are customarily stung by Bee Little, which makes them gradually shrink down in size. It wears off outside the town limits. Zim is a master of what he in his scientific manner calls micromorphosis and macromorphosis, both with the living and non-living. He shrinks the dragon Hadasse and her children, although the Love Fairy later convinces him to restore them. While capable of shrinking himself, he never does because he suffers from gigantophobia. He does temporarily become tiny in Tippetarius when Celestia invades the Emerald City, shrinking everyone in it to one thirty-second of their normal size. Even though Jinnicky has treated many of the inhabitants with anti-transformation potion, it doesn’t work against the size reduction. Zim uses one of Pessim’s berries to retain his size, then restores everyone in the city. At the end of the book, Zim overcomes his gigantophobia. In Giant Garden, the witch Magda creates a potion to make her vegetables grow to gigantic size, but it seeps into the ground and affects the moles and neighboring farms as well. Dorothy grows into a giant when exposed to it, and in a rarity in Oz books, her clothes don’t grow with her. This entry was posted in Characters, Eric Shanower, John R. Neill, L. Frank Baum, Magic, Magic Items, March Laumer, Melody Grandy, Oz, Oz Authors, Phyllis Ann Karr, Rachel Cosgrove Payes, Ruth Plumly Thompson and tagged baffleburg, big wigs, blinkie, bucketheads in oz, bunnybury, doorways, dwindlebury, ev, frogman, giants, glegg, glinda, growing, jack breton, jack pumpkinhead of oz, kabumpo in oz, larry breton, little dorothy and toto, little wizard stories of oz, loxo the lucky, magic muffins, mombi, nome king, ozma, peg amy, percy and the shrinking violet, percy the personality kid, polychrome, professor nowitall, professor wogglebug, rabbits, red jinn, red rogue, reddies, shrinking, skosh, snif the iffin, speedy in oz, terp the terrible, the cowardly lion of oz, the disenchanted princess of oz, the eldritch horror of oz, the emerald city of oz, the enchanted island of oz, the enchanted island of yew, the final fate of the frogman, the gardener's boy of oz, the giant garden of oz, the good witch of oz, the hidden valley of oz, the magic of oz, the marvelous land of oz, the ork in oz, the scarecrow of oz, the seven blue mountains of oz, the tin woodman of oz, tippetarius in oz, waddy, wag, witches, wizard of oz, zim greenleaf. Bookmark the permalink. Nice job, and a pretty exhaustive list, though I think there maybe other examples. IIRC, the dragon Quox was turned tiny by Tititi-Hoochoo in The Mysterious Chronicles of Oz. Yeah, I mostly stuck to canonical and what I see as near-canonical, so I’m sure there were quite a few examples I left out.